Welbike UK has been established to manufacture five replica Welbike’s, Series 2, Mark 1 complete with engine. Welbike will also supply all individual parts to enable customers to build a complete Welbike as required, or replace missing parts. 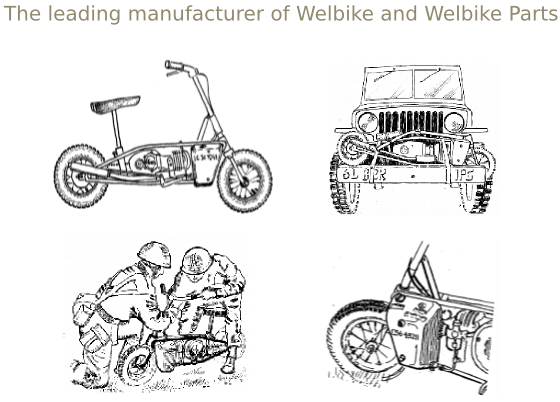 Welbike UK is a subsidiary of a long established Engineering Company based in the Midlands. The first Welbike has just been assembled ready for testing, parts list is being collated. Modern wheel bearings will be fitted to the wheels, but most parts will be a copy of the Welbike. Transfers, service books on the Junior Deluxe, chains, tyres, seat springs, cables, pumps, petrol taps, spokes and carburettor spares, will all be offered. Possibly the smallest military vehicle manufactured during World War II was the Welbike. It had to be small because it was meant to be dropped from an aircraft in a Mark I airborne container. This was 6ft 1” overall length and approximately 14” in diameter. The overall diameter of the wheels was 12.5”. The frame was a tubular welded construction which was quite advanced at this time. In fact the weight of the complete Welbike was only 70 lbs. Into the frame was fitted a Villiers Junior De-Luxe engine of 98 cc. With its horizontal cylinder it had a low profile. The petrol tanks mounted each side of the frame had to be pressurized as the outlet pipe was lower than the carburettor. The handlebars and seat folded close to the frame in this configuration to enable it to fit into the container. After being dropped from an aircraft, the parachute which was fitted into the end of the container would open. At one end of the container was a deformable end cone which took most of the impact on landing. On reaching terra-firma the machine was meant to be removed and the engine started within 15 seconds by a paratrooper. The range of the Welbike was approximately 90 miles. Anyone interested in the history of the Welbike would be advised to purchase the excellent book from “From Welbike to Corgi” by Peter Miller.